On behalf of the Board of Directors, Welcome! As you explore our website, you will see references to “Real Answers. Real Family. Real Faith”. Have you ever asked “Is this church the right place for me? Or “Can I trust that my offerings will be spent to further our mission? Or even “How can I serve?” The DRLC Board is committed to answering these questions and more to maintain the highest level of integrity and trust with the congregation. We are committed to show transparency in all that we do as your Board of Directors! Below is a brief description of how your Board of Directors governs at Divine Redeemer. 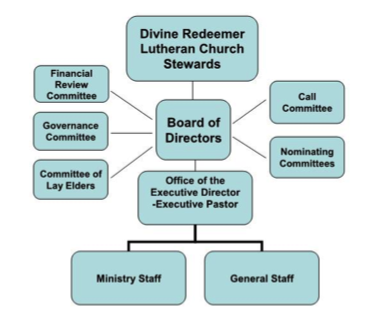 The steward’s (members) of DRLC are the holders of all congregational authority (see the organizational chart below – the executive pastor aka senior pastor is Pastor Jeff). You have delegated this authority to conduct and perform acts and affairs of the congregation in its stead between annual meetings to your elected Board. The Board of Directors primary responsibilities are to ensure that our strategic plan is followed, that the financial integrity of the congregation is maintained and that we keep each of you informed on our board and congregational activities. The board uses Carver’s policy based governance model. What this means is that we have established operational limits of the day to day operation at DR, and we are charged with monitoring these activities to ensure these limits are maintained and our mission is fulfilled. If you are interested in additional information on our constitution, bylaws and policies, please click here! Our current strategic plan was established in 2011. Outreach, Assimilation and Stewardship were the primary focuses established. Through this plan, we have been able to accomplish great things – but we are far from done and we need your continued prayers and support. The Board of Directors thank you for the opportunity to serve as your Board. We hope that you share the Board’s excitement at the tremendous progress made in the recent years and further share in our optimism for Divine Redeemer as we look forward to a bright future!